You should’ve been watching Dallas instead of Dynasty… JR was always exposing his nuts in some form I’m sure! Oh and I was casually stalking you on Twitter the other day and noticed that the Bloggess follows you… That pretty much makes you blogging royalty! It’s pathetic, but her following me is pretty much the greatest accomplishment I have to date. Aside from the people I birthed and that time I did CPR on a guy. 🙂 I lurve her. yeah, I noticed that ^ too the other day. you. have. arrived. 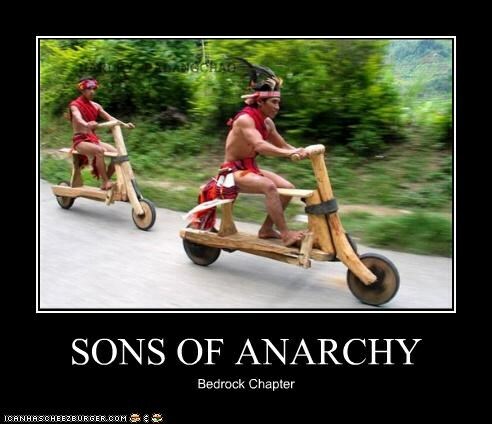 oh, and I guess I really must *make time* for sons of anarchy. finishing orange is the new black has left a gaping hole in my life. It takes two episodes to get sucked in, Mon, but after that…you’re all leather and gun running. 🙂 I miss OITNB. The fat hairy guy went down on TWO strippers? At the same time? No matter how closely you sandwich them, that’s a big strain on the tongue.